The heroic struggles of the Spanish workers against the fascists is a milestone in the development of the international class movement of the proletariat. Simultaneously, this struggle put an end to the hitherto uninterrupted course of victorious fascism and initiated a new period of growing class struggles. But this is not the only reason the Spanish Civil War is of great importance to the proletariat. Its significance lies also in the fact that it put to test the theories and tactics of anarchism and anarcho-syndicalism. Spain has always been the classical land of anarchism. The enormous influence which anarchist doctrines gained in Spain can be understood only in relation to the peculiar class structure of the country. Proudhon's theory of individual and independent handicrafts, as well as Bakunin's application of the same theory to factories, found wholehearted support by small peasants, land, and city workers. The anarchist doctrines were embraced by large sections of the Spanish proletariat and the acceptance of these doctrines was responsible for the spontaneous uprising of the workers against the fascist insurrection. We do not mean to say, however, that the development of the struggle was also determined by anarchist ideology or that it reflects the aim of the anarchists. On the contrary, we shall presently point out that the anarchists were compelled to give up many of their old cherished ideas and accept instead compromises of the worst kind. In analyzing this development, we shall prove that anarchism is incapable of solving the problems of the revolutionary class struggle. The anarchist tactics employed in Spain were unfit to cope with the situation, not because the movement was too small to allow for practical application but because the anarchist methods of organizing the various phases of the struggle were in contradiction to the objective reality. This stage of development reveals striking similarities with the Russian Bolsheviks of 1917. Just as the Russian Bolsheviks were forced to abandon, step by step, their old theories until, finally, they were compelled to exploit the workers and peasants with bourgeois-capitalist methods, so the anarchists in Spain are now forced to accept measures which formerly had been denounced by them as being centralist and oppressive. The development of the Russian Revolution has shown the incorrectness of the Bolshevik theories in solving the problems of the proletarian class struggle, and, similarly, the Spanish Civil War reveals the unfitness of the anarchist doctrines. It seems to us of great enough importance to point out the mistakes made by the anarchists, largely because their valiant fight has induced many workers — who clearly see the treacherous role played by the representatives of the Second and Third Internationals — to believe that the anarchists are right after all. From our point of view, this is a great danger, as it tends to increase the confusion already rampant within the working class. We consider it our duty to show, from the Spanish example, that the anarchist argumentation against Marxism is wrong; that, on the contrary, it is the anarchist doctrine which has failed. When it comes to understanding a certain situation, or to show ways and methods within a given revolutionary struggle, Marxism still takes the lead, and stands in sharp contrast to the pseudo-Marxism of the Second and Third International parties. The weakness of the anarchist theories was shown first by the anarchist organizations on the question organizing for political power. According to anarchist theory, the revolutionary victory would be assured and guaranteed by placing the management of the factories in the hands of the unions. The anarchists never attempted to take away the power from the Popular Front government. Neither did they work toward organization of a political soviet power. Instead of propagandizing the class struggle against the bourgeoisie, they preached class harmony to all groups belonging to the anti-fascist front. When the bourgeoisie began to curtail the power of the workers' organizations, the anarchists joined the new government, which, according to anarchist theories is a major deviation from their basic principles. They tried to rationalize this move with the excuse that, on account of the collectivization, the new people's front government does not represent a political power, as it did before, but is merely an economic one, because its members are representatives of the unions to which, however, members of the petty bourgeois Esquerra also belonged. The anarchists argued: because the power lies in the factories, and the factories are controlled by the unions, therefore the power lies in the hands of the workers. How this actually works out we shall see below. During the time the anarchists belonged to the government, the decree to dissolve the militia was issued. The incorporation of the militia, and the regular army, the suppression of the POUM in Madrid, were decreed with their approval. The anarchists helped to organize a bourgeois political power, but did nothing toward the formation of proletarian political power. It is not our intention to make the anarchists responsible for the development of the anti-fascist struggle and its diversion into a bourgeois blind alley. Other factors are responsible, in particular the passive attitude of the workers in other countries. What we most severely criticize is the fact that the anarchists have ceased to work toward a real proletarian revolution and that they identify themselves with the present development. They have thereby smoke-screened the position of the workers against the bourgeoisie, and given rise to illusions for which, we are afraid, they themselves will have to pay very dearly in the future. The tactics of the Spanish anarchists have found a number of critics in the foreign libertarian groups; some of these critics even accuse them of betraying anarchist ideals. But as these critics fail to see the actual situation their Spanish comrades are facing, they remain purely negative. It could not be otherwise. The anarchist doctrines simply cannot answer the questions that revolutionary practice raises. No participation in the government, no organization of political power, syndication of production, these are the basic anarchist slogans. With such slogans it is utterly impossible to deal effectively with the interests of the proletarian revolution. The Spanish anarchists fell back into bourgeois practices because they were unable to replace their unrealizable slogans with revolutionary proletarian ones. Precisely for this reason, the foreign libertarian critics and advisers could not offer any solution, for these problems can be solved only on the basis of Marxian theory. The most extreme position among the foreign anarchists is taken by the Dutch anarchists (excepting the Dutch Anarcho-Syndicalists of the NSV - Netherlands Syndikalist Vuband). The diehard anarchists of Holland refuse every fight which employs military weapons, because such struggle stands in contradiction to the anarchist ideal and goal. They deny the existence of classes. Although they cannot refuse to express their sympathy with the fighting anti-fascist masses. In reality, their position means a sabotage of the struggle. They denounce all action which purports to help the Spanish workers, such as sending weapons to them. The heart of their propaganda is this: everything must be done to prevent spreading the conflict to other European countries. They propagate "passive resistance", a la Gandhi, whose philosophy, translated to the objective reality, means the surrender of defenseless workers to the fascist butchers. The oppositional anarchists maintain that centralized power within the proletarian dictatorship or military staff will lead to another form of suppression of the masses. The Spanish anarchists retaliate by pointing out that they (in Spain) do not work for centralized political power; on the contrary, they favor syndication of production, which precludes exploitation of workers. They sincerely believe that the factories are in the hands of the workers and that it is unnecessary to organize all the factories on a centralized and political basis. The actual development, however, has proven already that centralization of production is taking place and the anarchists are forced to adjust themselves to the new conditions even against their own will. Everywhere that the anarchist workers neglect to organize their power politically and centralistically in the factories and communes, the representatives of the bourgeois-capitalist parties, including the Socialist and Communist parties, will undertake it. This means that the unions, instead of being controlled directly by the workers in the factories, will be ruled according to laws and decrees issued by the bourgeois-capitalist government. From this viewpoint, the question arises: is it true that the workers in Catalonia possessed the power in the factories after the anarchists had syndicated production? To answer this question, we need only to quote a few paragraphs from the pamphlet, "What is the CNT and FAI?" (The Official CNT and FAI publication). The management of the collectivized factories lies in the hands of the factory councils, which are elected in the general factory assembly. This council shall consist of from five to fifteen members. The term of official service on the councils is two years. . . Factory councils are accountable before the plenary assembly of the enterprise and the general council of its branch of industry. Together with the general council of its industrial branch they are in charge of regulating production. They also determine questions of compensation, sanitary conditions, health care, etc. Every factory council chooses a director. In factories with more than 500 workers, the choice must be approved by the council of that industry. With the approval of the workers, each factory appoints a delegate of the factory council to the Council of Industry of the Generalitat. The factory council reports regularly to the factory assembly and the council of that industry on its activities and plans. In case of incompetence or refusal of the performance of the assigned tasks, the assembly of the factory or the Industry Council can force the resignation of the members of the factory council. If a member of the factory council is forced to resign by the Industry Council (IC) against the will of the workers, then they may appeal the decision before the IC. The IC will then make a decision after having heard the report of the Anti-fascist General Economic Council. The General Economic Council, which brings together the different branches of industry, consists of four representatives from the factory councils, eight representatives of the various unions (respecting the proportionality of all political groups), and four technicians. The latter are appointed by the Anti-fascist General Economic Council. This council is headed by a member of the Council of Industry of the Generalitat. The General Economic Council has the following tasks: organizing production, evaluating costs, eliminating competition between enterprises, finding out the demand for industrial products, as well as studying the domestic and foreign markets, evaluating the profitability and consolidation of enterprises, reorganizing production methods, controlling prices, establishing central markets, acquiring means of production and raw materials, granting credits, creating technical laboratories, making production and consumption statistics, replacing the foreign raw materials for local products, etc. It does not require much thought to realize that these proposals leave all economic functions in the hands of General Economic Council (GEC). As we have seen, the GEC consists of eight representatives from the unions, four from the Anti-fascist General Economic Council, in their capacity as technicians, and four representatives of the factory councils. The Anti-fascist GEC was formed at the beginning of the revolution and is composed of representatives of the unions and the petit bourgeoisie (Esquerra Republicana de Catalunya, etc.). Only the four factory council delegates can be counted upon as direct representatives of the workers. We must also emphasize that in case of withdrawal of the factory committee representatives, the Ministry of Industry of the Generalitat and the Anti-Fascist General Economic Council have a decisive influence. The GEC may dismiss members of the opposition in the council against which workers may appeal to the council of Industry, but the power of decision rests with the Anti-fascist GEC. Factory councils organize working conditions, but they are responsible not only to the workers in the factory, but also to the Industry Council. The factory council can appoint the director, but for large enterprises the consent of the Council of Industry of the Generalitat is needed. In short, we can say that today the workers have little say about the control and organization of factories. In reality, the unions govern. We will investigate what this means. From the few facts mentioned, we cannot share the enthusiasm of the CNT about the "social development". "In public offices beat the life of a real constructive revolution", writes Rosselli in What is the CNT and the FAI? (p. 38 and 39 of the German edition). From our point of view, the heartbeats of a revolution do not pulsate in public office, but in the factories. In the offices throb the heart of a different life, that of bureaucracy. We do not criticize the facts. The facts, realities, are determined by circumstances and conditions that are beyond the control of particular groups; that Catalan workers have failed to establish the dictatorship of the proletariat is no fault of theirs. The main reason is to be found in the confused international situation that puts the Spanish workers in opposition to the world. In such conditions it is impossible for the Spanish proletarian to free himself from his petit bourgeois ally. The revolution was doomed before it really began. No, we do not criticize the facts. We do, however, criticize the anarchists for confusing the conditions in Catalonia with socialism. All those who tell workers of socialism in Catalonia, partly because they believe it, partly because they do not want to lose their influence on events, prevent workers from seeing what is actually happening in Spain. They do not understand the revolutionary principles and thus render more difficult the development of a revolutionary struggle. Spanish workers cannot effectively fight the leadership of the union, as this would mean the complete collapse of the military fronts. They have no other alternative. They must fight the fascists to save their lives, and must accept any aid regardless of where it comes from. They do not wonder whether the result of all this is socialism or capitalism; they only know they have to fight until the bitter end. Only a small section of the proletariat is consciously revolutionary. So long as the unions organize the revolutionary struggles, the workers will support them; that this leads to a compromise with the bourgeoisie is undeniable, and is regarded as a necessary evil. The slogan of the CNT, "First victory over the fascists and then revolution", expresses the sentiment still prevailing among militant workers. But this feeling can also be explained by the general backwardness of the country that not only makes possible, but forces the proletariat into compromise with the bourgeoisie. From this it follows, then, that the character of the revolutionary struggle is undergoing profound changes and, instead of pointing to the overthrow of the bourgeoisie, it leads to the consolidation of a new capitalist order. The working class in Spain struggles not only against the fascist bourgeoisie, but against the bourgeoisie of the entire world. The fascist countries, Italy, Germany, Portugal and Argentina, support the Spanish fascists in this struggle with all means at their disposal. This fact alone suffices to make the victory of the revolution in Spain impossible. The enormous power of the enemy state is too strong for the Spanish proletariat. If the Spanish fascists, with their enormous power, haven’t won up to now, and have suffered military defeats on several fronts, it is because the anti-fascist government has been supplied with modern weapons from abroad. While Mexico, from the beginning, has supplied ammunition and weapons on a small scale, the support of Russia began only after five months of war. Help came after the fascist troops, equipped with modern Italian and German weapons, and further aided by the fascist countries, forced back the anti-fascist militias. From this resulted the possibility for further fighting. Another consequence was that Germany and Italy were forced to send more arms and even troops. Hence, these countries have more and more influence on the political situation. With such development of events, France and England, anxious because of their relationship with its colonies, could not remain indifferent. In light of these developments, the Spanish war takes on the character of an international conflict between the great imperialist powers, who openly or covertly involve themselves in the war in order to preserve or gain new positions of dominance. The two hostile fronts in Spain are being supported with arms and material aid. It is impossible to predict when and where this fight will end. While the Spanish workers are saved thanks to foreign aid, the revolution is being dealt its death blow. Modern foreign weapons contribute to the military battle and, consequently, the Spanish proletariat is subjected to imperialist interests, and primarily to Russian interests. Russia does not help the Spanish government to advance the revolution, but to prevent the growing influence of the Italians and Germans in the Mediterranean. The detention of Russian ships and their cargo clearly designates what Russia can be expected to allow when it permits the victory of Italy and Germany. Russia tries to become entrenched in Spain. We indicate only how, as a result of Russian pressure, the Spanish workers gradually lose their influence on the course of events, how the militia committees are dissolved, the POUM excluded from the government, and the hands of the CNT tied. For months now, weapons and munitions have been denied to the POUM and CNT on the Aragon front. This shows that the power upon which the Spanish anti-fascists depend materially also controls the struggle of the Spanish workers. They may try to rid themselves of Russian influence, but they cannot do without Russian help and, ultimately, will have to accept all its demands. So long as workers outside of Spain do not rebel against their own bourgeoisie and, through these actions, give aid to the revolutionary struggle within Spain, Spanish workers will be compelled to sacrifice their socialist aspirations. The actual cause of the internal defeat of the Spanish Revolution must be sought in the fact that the Spanish workers depend on material help from the capitalist countries (and more specifically, the Russian state-capitalism). If the revolution should spread over a wide enough area, and if, for example, it would affect England, France, Italy, Germany, Belgium, then things would be very different. Only if the counter-revolution in the main industrial areas of Europe were crushed, as it has been in Madrid, Catalonia, and Asturias, would the power of the fascist bourgeoisie shatter. White Guard troops would continue to pose a threat to the revolution in the reactionary areas, but they could no longer defeat it. Troops which do not have their base in relatively large industry will soon lose their power. If the proletarian revolution occurred within the major industrial areas of Europe, workers would not depend upon foreign capitalist powers. They could seize all power. So, again, we assert that the proletarian revolution can only achieve victory if it is international. If it is confined to a small region, then it will be crushed by the military, or degenerate by being used towards imperialist interests. If the proletarian revolution is sufficiently strong internationally, then it need not fear degenerating towards state or private capitalism. In the following section, we will address the issues that would arise in such circumstances. Although we noted in the previous section how the international situation forced the Spanish workers to make compromises with the bourgeoisie, this does not mean that the class struggle in “Red” Spain has ended. On the contrary, it continues behind the curtain of the anti-fascist Popular Front, and is proved by the assaults of the bourgeoisie on each one of the bastions of workers' committees, by the continuous strengthening of the position of the government. Workers in "Red" Spain cannot be indifferent to this process; for their part, they should try to maintain the positions they’ve won to prevent further intrusion of the bourgeoisie and give a new revolutionary direction to the events. If workers in Catalonia do not fight against the advances of the bourgeoisie, their absolute defeat is certain. If the Popular Front government were to beat the fascists, it would use all its power to push back the proletariat into its former position. The struggle between the working class and the bourgeoisie will continue in conditions much worse for the proletariat; because the "democratic" bourgeoisie, after the victory over the fascists, will then make use of all its forces in the anti-proletarian struggle. The systematic breakdown of the power of the workers has been carried out for months, and in the speeches of Largo Caballero, one can already recognize what the workers can expect from the current government once they have achieved victory for it. We have stated that the Spanish revolution can only achieve victory if it becomes international. But the Spanish workers cannot wait for the revolution to begin in other parts of Europe; they cannot expect help which, so far, has consisted of nothing other than good intentions. Now they have to defend their cause, not only against the fascists, but against their own bourgeois allies. The organization of power is, in the present circumstances, a pressing need. How does the Spanish workers’ movement answer this question? The only organization that provides a concrete response to this question is the POUM. It propagandizes for the election of a general congress of councils, out of which will emerge a truly proletarian government. To this, we say that there is still not the basis for a proposal of this type. The so-called "workers' councils" that have not yet been eliminated, are largely influenced by the government, which has intensified control over their composition. However, the congressional election would not guarantee the power of workers on production. Social power means more than just government control. Only if the proletarian power penetrates all social life can it maintain itself. The central political power, however great its importance, is simply a link in the scale of power that is rooted in every sphere of social life. If workers are to organize their power against the bourgeoisie, they must begin their task from the bottom. First, they must release their factory organizations from the influence of political parties and unions, because the latter binds workers to the current government and, therefore, to capitalist society. They should try to influence, through their factory organizations, every sphere of social life. Only on this basis is it possible to build a proletarian power; only from this basis can the forces of the working class function in harmony. The question of political and economic organization of the revolution cannot be separated. The anarchists, who denied the need for a political organization, could not provide an adequate solution to the problem of economic organization. Such questions as the coordination of work in different factories with the movement of goods, are interrelated issues that have to do with the formation of the political power of the workers. The power of the workers in the factories cannot be maintained without the building of a political workers’ power, and the latter cannot be maintained as workers’ power if it is not rooted in the organization of the factory councils. So, having demonstrated the need to build a political power, the question arises as to the form of proletarian power, how it is integrated with society, and how it is rooted in the factories. Suppose the workers of the main industrial areas, for example, in Europe, had seized power and largely crushed the military power of the bourgeoisie. Then the greatest external threat to the revolution would have been eliminated. But how are the workers, as collective owners of the factories, to face the problem of setting in motion production in order to satisfy society’s needs? Raw materials are necessary for this. But where do they come from? And after making the products, where are they sent? Who needs them? None of these problems can be solved if every factory were to work on its own. The raw materials for the factories come from all over the world and the resulting products are consumed worldwide. How are workers to know from whom they must obtain their raw materials? How are they to find consumers for their products? Products cannot be produced at random. Workers cannot supply raw materials and products if they do not know that they will be used appropriately. If economic life is not to collapse immediately, then we must find a way to organize the movement of goods produced. Herein lies the difficulty. In capitalism, this task is performed by the market, by money. In the market, the capitalists, as product owners, will meet each other; here the needs of society are determined. Money is the measure of those needs. Prices express the approximate value of the products. In communism, these economic forms that are born from and are bound to private property will disappear. Hence, the question arises: how to establish and determine social needs in communism? We know that the free market can fulfill its role only in a very limited way. The needs of the market measures are not determined by the actual needs of the people, but by the purchasing power of the owners and the amount of wages received by workers. In communism, the real needs of the masses will be satisfied and not only those that depend upon the contents of their pockets. It is clear that the actual needs of the masses cannot be determined by a bureaucratic apparatus either, but by the workers themselves. The first question before us is not whether workers are able to do this, but who has the disposal of the products of society. If a bureaucratic apparatus is to determine the needs of the masses, then a new instrument of power over the working class is created. Therefore, it is essential that workers unite in consumers’ cooperatives and thereby create the organism that gives expression to their needs. The same is true in the factories. The workers united in the factory organizations will establish the amount of raw materials needed for the goods they have to produce. There is only one way to establish the real needs of the masses in communism: the organization of producers and consumers, that is, the organization of workers into factory organizations and consumer cooperatives. It does not suffice that workers know what they need for their subsistence and for the factories to know the required amount of raw materials. Factories exchange their products; there is a change of matter, the products themselves undergo transformations that follow different phases, through various factories, until they enter the sphere of consumption. To enable this process, it is not enough to determine the quotas, but to administer them as well. Thus we come to the second mechanism that should replace the free market; that is, the general social accounting. This accounting should contemplate the reports obtained from the different factories and consumer cooperatives in a precise way, so that it offers a clear view of the needs and possibilities of meeting them by society. If a central accounting institution is not formed, then the total production would be plunged into chaos when private ownership of the means of production is abolished along with the free market. The free market cannot be abolished before organizing the production and distribution of goods by cooperatives of producers and creating the central accounting institution. Russia demonstrated how the "free market", despite all the measures taken by the Bolsheviks to suppress it, maintained itself, because the mechanisms that were supposed to replace it did not work. In Spain, the inability of organizations to establish a communist production is clearly demonstrated by the existence of the free market. The old form of property ownership has changed its face now. Instead of the personal property of the means of production, the unions have assumed the role of the former owners in a slightly modified form. The form has changed, but the system remains. Property has not been abolished. Exchange of goods has not disappeared. That is the great danger that threatens the Spanish revolution from within. The main task of the workers is to find a new way of distributing goods. If they maintain the current forms, they would open the door to the full restoration of capitalism. In case the workers achieve a centralized distribution of products, then they have the task of keeping the central apparatus under control. This apparatus, which is created solely for statistical purposes and registration, contains the possibility of appropriating the functions of power for itself and constituting an instrument of power that can be utilized against the workers. This development would be the first step in the direction of state-capitalism. This trend has been clearly discerned in Spain. The leaders of the unions are able to dispose of the apparatus of production. They also have a decisive influence on the military formations. The influence of workers on the economic life does not go beyond the influence of their unions. How limited this influence is can be demonstrated by the measures of the unions, which failed to materialize into a serious attack against private property. If workers take over the regulation of economic life, one of their first actions will be directed against the parasites. The fact that everything can be bought with money, and that money is the magical power which opens all doors, will disappear. Among the first actions of the workers will be, without a doubt, to create a kind of job card. This card will only by obtainable by those who perform useful work. (The adoption of special measures for the elderly, sick, children, etc., will certainly be needed). In Catalonia this did not happen. Money remains the medium of exchange for products. Some control over the movement of products had also been introduced, which did not impede workers from having to bring their scarce possessions to pawn shops, while the estate owners were offered guarantees and an income of 4% of their capital (L'Espagne Antifasciste, October 10). There is no denying that the unions were unable to do otherwise without jeopardizing the unity of the anti-fascist front, and that they believed they’d surely gain back all they had given up once they had defeated the anti-fascists and made all the necessary reforms. The libertarian character of the CNT would guarantee this. But those who argue this make the same mistakes as the various Bolshevik factions, both left and right. The measures taken so far clearly demonstrate that the workers have no power. How can one defend the point of view that the same union apparatus which dominates the workers, will, after the defeat of the fascists, voluntarily cede power to the workers? Certainly, the CNT is libertarian. But even if we assumed that the leaders of this organization would be willing to give up their power when the military situation permits, what sort of change would this amount to? Power is neither in the hands of this or that leader; power is in the hands of the great apparatus composed of "bosses", of all the classes which dominate key positions as well as minor. They would be able, at the moment of being displaced from their privileged positions, to turn the entire production system upside down. Here the same problem that played such a crucial role in the Russian Revolution is presented. The bureaucracy sabotaged the whole of economic life so long as workers exercised control of the factories. The same is true of Spain. 5. The Committee of Syndical Unity exercises control over all production by acquiring the necessary materials for farming, planting and harvesting. 6. As a basis for relations with other regions, each committee shall perform the exchange of goods equating the value of the products at current prices. 7. To expedite its task, the committee should compile statistics of the people who are unable to work and those who are, in order to know who can be counted upon, and how much food, according to the size of each family, is to be rationed. 8. All expropriated land will be collectivized. The only land which will not be collectivized is the land whose owners demonstrate a physical and professional capacity which suffices to extract the maximum possible productivity. (Moreover, the land of smallholders cannot be confiscated. All seizures are to take place with the presence of the organs of the CNT and UGT). These resolutions must be understood as a kind of plan, according to which the Unitary Syndical Committee will organize agricultural production. At the same time, we must clearly stress that the management of small farms, as well as the management of big farms, which must ensure maximum rentability, remains in the hands of their former owners. The remaining land is to be turned over for communal purposes. Meaning they must be under the control of the union committees. Furthermore, the Syndical Unity Committee has control over the whole production. But there’s not a word about the role of the producers themselves in this new organization of production. This problem does not seem to exist for the UGT. The only see in their function the establishment of another form of management; namely, the management of the SUC, which remains on the basis of wage labor. Thus, the maintenance of the wage system determines the development of the proletarian revolution. If workers remain wage workers, as before, albeit in the service of a committee formed by their own union, their position in the production system would remain the same. The social revolution will be displaced from its trajectory because of the struggle for economic management of the unions or parties, which will inevitably begin. The question thus arises: to what extent should the union be considered the real representative of workers? In other words, what influence will the workers have over the union committees that dominate economic life? Reality teaches us that workers lose all their influence or control over these organizations, even in the best of cases, if all workers are organized in the CNT and the UGT and they themselves choose the committees, as these are gradually changing, since they function as independent organs of power. The committees formulate all guidelines governing production and distribution without being accountable to the workers who’ve raised them to these functions, and cannot be replaced at any time, at the behest of the workers. They have the right to dispose of all necessary means of production for labor and products, while the worker receives a certain amount in wages, in proportion to the labor performed. The problem of Spanish workers is, at present, to preserve the power over the union committees that govern production and distribution. Here we see how the anarcho-syndicalist propaganda, produces the opposite effect: the anarcho-syndicalists argue that all obstacles have been overcome when the unions direct production. They only see the danger of the formation of bureaucracy in the state organs, but not in the unions. They believe their libertarian ideals somehow preclude that outcome. The last plenary session of the Regional Federation of anarchist groups in Catalonia (...) has made clear the point of view of the anarchists against the current situation. We describe each of the resolutions commenting briefly. 4. It is necessary to abolish the parasitic bureaucracy that has developed considerably in the municipal and state agencies. The state is the eternal breeding ground for a certain strata: the bureaucracy. At present, the situation is becoming serious. It drags us through channels that endanger the revolution. Collectivization of farms, the establishment of councils and committees become the breeding ground for a new bureaucracy developed from within the workers themselves. Ignoring the aims of socialism and divorced from the spirit of the revolution, those elements who run the shops or industries outside the control of the unions, quite often act as bureaucrats with absolute authority and behave as new employers. In the state offices and local agencies, one can see the growth of these "office artists”. This situation needs to end. It is the task of unions and workers to curb this trend toward the expansion of bureaucracy. It is the union which should solve this problem. Parasitism must disappear from the new society. Our immediate duty is to begin to fight with our most effective weapons. But driving out the bureaucracy through the unions would be like overthrowing the devil with the aid of Beelzebub; because it is the conditions of power and not idealistic dogmas which determine all the new developments. Spanish anarcho-syndicalism, nourished by anarchist doctrines, expounds free communism and is against all forms of centralized power; however, its own power is concentrated in the unions and therefore these organizations are the means by which anarcho-syndicalists will realize "free" communism. We have seen that the theory and practice of the Spanish anarcho-syndicalists are totally different. This was obvious when the CNT and the FAI were only able to maintain their positions by disavowing, step by step, their previous anti-political stance and at the same time, is now reflected in the "economic structure" of the revolution. Theoretically, they are the vanguard of a "free" communism. However, in order to move the "free" enterprises to the interests of the revolution, they have been forced to rob these enterprises of their autonomy and subordinate production to a central management. Practice compels the total abandonment of the theory, which means that the theory is unfit for practice. We will find an explanation for this discrepancy at once if we subject to thorough analysis the theories of "free communism”, which are ultimately premised on the ideas of Proudhon, adapted by Bakunin to modern production methods. However, the influence of Proudhon on syndicalist conceptions is not limited to these relatively unimportant questions. His idea of socialism is the foundation of the entire anarcho-syndicalist doctrine, with only slight changes regarding modern and highly industrialized conditions. The conception of the CNT simply classifies enterprises as independent units in their "socialism with free competition". It’s true, the syndicalists do not desire to return to small-scale enterprises. They propose the liquidation of small enterprises, or to let them die a natural death when they cease to function rationally. However, substituting Proudhon’s "small enterprises" for "large enterprises", and "artisans" with "unionized workers", provides a clear enough picture of the CNT’s brand of socialism. In reality, these theories are utopian. They are particularly inapplicable to the conditions in Spain. Free competition at this stage of development is no longer possible, much less in a state of war and chaos, as in Catalonia. Where a number of enterprises or whole communities liberated and made themselves independent of the rest of the productive system — indeed, only to exploit the consumers of their goods — now the CNT and the FAI must suffer the consequences of their economic theories. They were forced to this step by the need to remain united in the anti-fascist front which, if broken, would be a serious danger in a time when the civil war requires the unification of all forces. They knew no other way out than that already applied by the Bolsheviks and Social Democrats: the abolition of the autonomy of enterprises and their subordination to a central management. The importance of this initiative is not at all diminished by the fact that this management is established through their own union. If workers are nothing other than waged workers employed in the system of centralized production, then this is, despite what the CNT says, a system operating according to capitalist principles. This contradiction between theory and anarchist practice is primarily due to their inability to provide a solution to the biggest problem of the proletarian revolution, as it concerns the economic organization; that is, how and in what way is the share of the total output of the productive system to be determined for each member and participant? According to anarchist theory, the amount by independent enterprises or free individuals would be determined through the use of "free capital", through market production and return on total value through exchange. This principle is maintained even when, years ago, the need for a planned production and therefore a central accounting institution were obvious. The anarcho-syndicalists see the necessity of planning within economic life and believe it would prove impossible without a central accounting institution responsible for the statistical formalization of production factors and social needs. However, they forget to clarify the basis of statistical needs. It is a proven fact that production cannot be statistically established and organized on a planned basis without a unit of measurement applicable to the products. Communism means production according to the general needs of the masses. The question of how much an individual can consume and how many raw materials and intermediate goods should be distributed among the different factories cannot be resolved by the capitalist monetary system. Money is the expression of certain types of private property relations. Money assures a relative share of the social product to its possessor. This applies to both individuals and enterprises. However, in communism there is no private ownership of the means of production, although each individual is entitled to a share of the social wealth for consumption, and every factory should have the raw materials and means of production necessary. How this will be accomplished, the syndicalists answer only vaguely, hiding behind statistical methods. But therein lies one of the biggest problems of the proletarian revolution. If workers would simply leave that determination to a "statistical bureau”, then they would create a power over which they themselves would lose control. On the other hand, the regulation of production is impossible if workers in the factories are simply entitled to any amount of goods. We must, therefore, address the following problem: how can we unite, putting into accord, both principles which appear contradictory at first glance, all power to the workers, which means a concentrated federalism, and the planned regulation of production, which entails the greatest possible degree of centralization? We can answer this two-fold question only by considering the real foundation of social production as a whole. Workers contribute one thing to society: their labor-power. In a society without exploitation, as communist society, no other measure than the individual labor-power contributed to society can be valid for receiving from society the means of existence. During the production process, raw materials are converted into commodities by adding labor-power to the mix. A statistical bureau today would be utterly incapable of ascertaining the amount of labor embodied in any given product. The product has passed through many hands, in addition to the immense number of machines, tools, raw materials and half-finished products that have been employed in its creation. 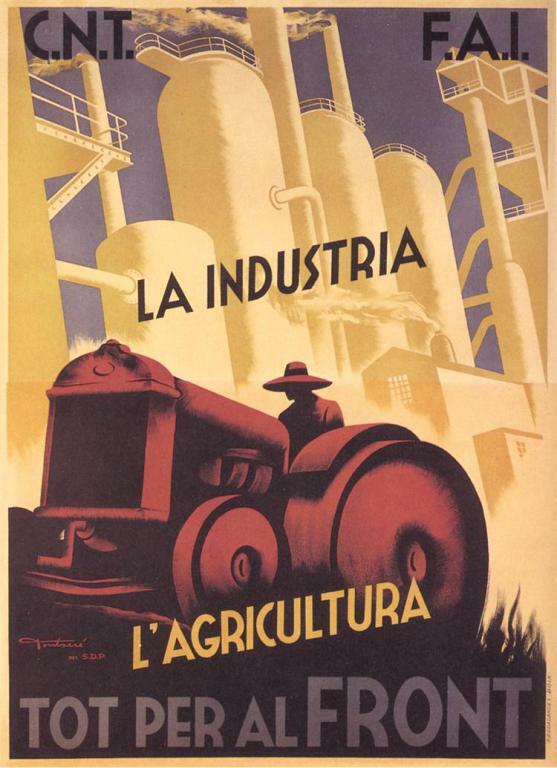 While it’s possible for a central statistical office to collect the data necessary for a clear picture, comprising all the branches of the entire production process, individual factories and enterprises are much better situated to determine the amount of labor crystallized in the finished products by calculating the labor-time embodied in raw materials as well as that which is required for the production of new goods. Since all enterprises are interconnected in the production process, it is easy for individual enterprises to determine the total labor-time required for a finished product from the available data. Moreover, it is quite easy to calculate the labor-time socially necessary on average by dividing the total labor-time expended by the sum of products obtained. This is the final determining factor for the consumer. To obtain a product, he will simply need to demonstrate that he has contributed to society in a different way, the amount of labor-time crystallized in the consumer product that he wants for consumption. This precludes exploitation. Each receives what he has contributed; that is, the same amount of socially necessary labor-time. In communism, there is no room for a central statistical bureau to determine the “share” of the social product corresponding to the different categories of workers. The quantity for consumption of each worker is not determined from "above"; each worker himself determines how much work he may demand from society. There’s not another choice in communism; at least not during the first phase. Statistical bureaus can serve only administrative purposes. These bureaus can, for example, calculate the average social values from the data obtained from the factories, but these bureaus are to be regarded as enterprises in and of themselves, like any other. They would have no privilege. Communism could not exist where a central bureau exercised executive functions; in such circumstances, there could exist only exploitation, oppression, capitalism. We wish to emphasize two points: 1) that should another dictatorship arise, this dictatorship could not be separated from the principles of production and distribution which govern society; 2) if labor-time is not the measure of production and distribution, but economic activity is regulated by a "statistical bureau" that determines the "ration" that workers are intended, then in that situation a hybrid system of exploitation would be operating. As it concerns the introduction of a medium of exchange resembling the present-day money and which would function in order to facilitate exchanges, these means of exchange would be administered through a ‘credit council’. The need for a unit of calculation to carry out the evaluation of social needs and to serve, at the same time, as a unit of measure for consumption and production are completely overlooked. The means of exchange have, in this case, only the function of facilitating exchanges. How this will be accomplished is something that remains a mystery. And no mention is made either about the unit of measurement for expressing the value of the products in these means of exchange. There is no indication of how to quantify the needs of the masses, whether through factory councils or consumer organizations, or through technicians in the administrative offices. On the other hand, the technical equipment of the productive apparatus has been dealt with extensively. Thus, economic problems become technical problems for syndicalists. There is a close relationship between the syndicalists and the Bolsheviks in this regard: their main focus has been on the technical organization of production. The only difference between the two is the greater naiveté of the syndicalists. Both elude the question of the formation of new economic laws of motion. Only the Bolsheviks are able to respond specifically to the question of the technical organization, which results in absolute centralization under the direction of a dictatorial apparatus. The syndicalist, meanwhile, in his desire for "the autonomy of enterprise units” fail to resolve even this problem. In fact, when faced with this problem, they sacrifice the workers’ right to self-management in trying to resolve it. The right of the workers to self-management over the factories and enterprises on the one hand, and the centralization of management of production, on the other, are incompatible to the extent that the foundations of capitalism, money and commodity production, remain in place, and a new mode of production, based on the socially necessary labor-time, has not yet replaced them. Workers cannot achieve this with the aid of parties, but only by their own action. Yeah, thanks for translating and posting this! Keep an eye out for more obscure council communist texts and Belgian left-communist stuff. Gulp. The CWO published this in Revolutionary Perspectives No 1 (1974) but we forgot all about it. It would have saved someone some work if we had digitalised it. However we only used the Mattick translation so perhaps this one reads better. Anyway thanks for publishing it again. I didn't know that it had been published by the CWO at all, but you're right, that might've saved me a lot of trouble. Actually, I was initially just transposing this text from a pdf file containing vol. 3, nos. 5 and 6 of Paul Mattick's ICC, but I had read it in Spanish before at the Bataille Socialiste site, and I basically began anew because I didn't really like Sam Moss' translation. Very interesting piece. It's unfortunate that the author doesn't give any mention to the rural collectives in Aragon, which as I understand went quite a bit further in terms of communizing basic goods and were also less directed by the CNT leadership than the industrial collectives. Also some very questionable assertions about anarchism that I think greatly overstate the influence of Proudhon (since when was "free capital" a pillar of anarchism as it existed as a mass movement?) and the last section seems to strangely abandon the principle of "to each according to their need" in favor of "Each receives what he has contributed; that is, the same amount of socially necessary labor-time." I think the author is clear that he's only referring to the first phase of communism, which is consistent with what Marx himself had written in the Critique of the Gotha Program. does anybody has a german version of this text (or a pdf) and could send it to info[a]anarchismus.at? Referring back to Tyrion's and Santos's response above - anyone interested in looking at this aspect some more could usefully look up David Adam's text 'Marx's critique of socialist labor-money schemes and the myth of council communism's Proudhonism' on this site which has some interesting follow up discussion. My link doesn't work on this one. As Emanuel points out they translated it from Spanish. I think it's important that we also get the original Sam Moss translation up at some point or the CWO pamphlet.